Ontech’s Wardiam home security system utilizes a truly new sensors technology which is based on the control, management and measurement of magnetic and electrostatic fields (CMF) is truly a completely new and disruptive technology in the security sensor industry in many years. Ourbringing with it new capabilities not possible with any of the sensor technologies available until now. Our CMF technology offers the ability to remain ON all the time and even detect intrusions when doors and windows are already open, something PIR and magnetic contacts cannot do. Additionally, our CMF sensors can also detect an intrusion before it happens, hopefully avoiding the traumatic experience of a break-in, again something existing sensor technologies cannot do. Ontech’s CMF sensors make all of these new capabilities possible while at the same time increasing reliability and reducing false alarms with the unique discriminating capabilities of our technology. 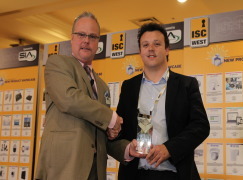 Ontech's Wardiam was awarded the Best Intrusion and Prevention Solution Product at the New Product Showcase in the ISC WEST (Las Vegas) last month. FOR MORE INFORMATION CONTACT ONTECH SECURITY S.L.